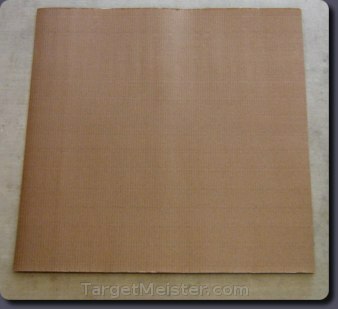 30" x 48" roll-able cardboard target backings. Rolls up and is extremely portable. Sold in packs of four. Perfect when space is limited. Once mounted, just as durable as regular cardboard backers. These roll-able target backers are a key component in our portable target systems. Because of their roll-able nature, they conveniently fit into our target system bag. You will get peace of mind always knowing you have a bag full of reliable target backings stored with your target stand. No more digging through the garage or the garbage for a filthy piece of cardboard that is barely suitable as a target backing. Worse yet, realizing you don't have a backing once you are already at the range! Although these backings are roll-able for your convenience, they become very rigid target backings when firmly mounted to wooden target support strips. For maximum rigidity, mount the backings with the fluting perpendicular to the mounting strips. reduces rips and tears in targets from bullets, producing cleaner holes and easier scoring. greatly minimizes torn or flapping targets in high winds. It is best to just use these reusable, long-lasting target backers. You can sail hundreds rounds through these backings before needing to replace them. Of course, it depends on your caliber, groupings, utilization of the backing's surface area, and the size of the backer. And if you didn't mutilate it while attaching it to the target support strips, you can peel it and reuse it on the next shoot.